Just wanted to share a funny photo from last christmas day at my father's house. 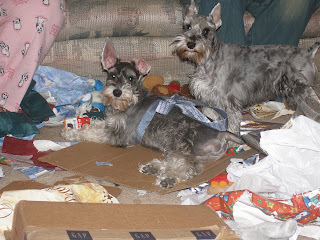 That's Hans (with the bow) and Sydney on christmas day after they've ripped into all the wrapping paper. Silke wanted no part of the action and sat on Sandy's lap. Wild dogs!